January 22, 2017, 5:03 PM · Personally, I wasn't sure if I could get in the mood for a concert on Friday night, so saturated was my newsfeed -- and soul -- with the dissonant political overtones of the day. But with Gil Shaham performing with the Los Angeles Philharmonic, I had to try. As it turned out, I've rarely felt so grateful for music. It was the kind of performance that reminded me of the uplifting power of the arts, to bring people a sense of beauty and order in times of unease and upheaval. The evening opened with a satisfyingly precise and brisk "Night on Bald Mountain" by Modest Mussorgsky, highlighted by exquisite solos by clarinetist Burt Hara and flutist Denis Bouriakov. 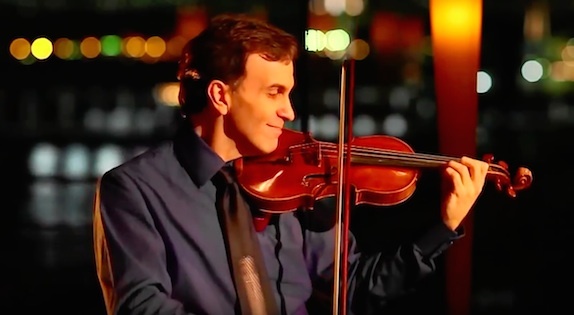 Then came violinist Gil Shaham -- it's hard not to smile when this joyous man simply walks on stage. He greeted his audience and colleagues with great collegiality, then launched straight into the opening of Sergei Prokofiev's Violin Concerto No. 2. Prokofiev 2 is a concerto from the 1930s, a time period that has become something of a personal project for Shaham, having released seven 1930s concertos in two albums over the last few years, 1930s Violin Concertos, Vol. 1 and 1930s Violin Concertos, Vol. 2. "Every note is perfectly placed, and surprising at the same time. It's a miracle of a piece," Shaham said of the concerto, in an interview last year. "We often think of Prokofiev as being very witty...but nowadays when I look at this piece, I see some very dark moments." The concerto opens with a single haunting line, played by the violin alone. As the orchestra joined, Shaham seemed to take great pleasure in the conversation, leaning in and smiling to acknowledge the various sections. The second movement features one of the most beautiful and soaring melodies written for violin, interrupted at times by busy and mischievous interludes. The solo violin always triumphs, reaching ever higher, and Shaham made it look easy to pick those notes out of the stratosphere and make them all shimmer. The last movement is a kind of lopsided dance, which turns into a tense race in ever-changing meters. Shaham took a very fast tempo indeed; it was exhilarating to the end. As an encore, Shaham played the "Gavotte en rondeau" from Bach's Partita No. 3, with ease and mastery, tossing it off with his characteristic speed and well-placed embellishments. The second half of the concert featured a fantastic reading of Igor Stravinsky's Petrushka, under the capable baton of French conductor Lionel Bringuier. Bringuier's restraint, precision and attention to detail paid off in a highly coordinated and satisfying performance of a piece with notoriously complex demands. Live performance brings out the drama in this music: Stravinsky often puts sections of the orchestra at odds with each other, then brings them together in a jubilant and glorious show of sonic force. At other times, the music narrows to a single note on a single instrument, or a barely-accompanied solo. Petrushka is full of "audition excerpts" for wind and brass, and LA Phil musicians certainly rose to the occasion, with bold solos from flutist Bouriakov and trumpeter Thomas Hooten, as well as fantastically precise playing by pianist Joanne Pearce Martin. What a kaleidescope of orchestral gestures, and Bringuier's pacing was spot-on. I left the hall grinning from all the glorious noise. January 23, 2017 at 09:46 PM · I saw Shaham perform this in Blacksburg with The Knights. My review is in my blog.